Getting really uncomfy and short of starving keep gaining about 5 lbs a week! Argh! My Aviana and Zander move around quite a bit, but at different times. Aviana (Twin A) moves in the am/day hrs and Zander (Twin B) moves in the evening....oh the joys of pregnancy! I am 26 wks with g/b twins. weight gain so far...53 lbs, almost 48" around at belly button. stretch marks coming - argh!!! Here I am at 32 wks...wow it's been a long haul. 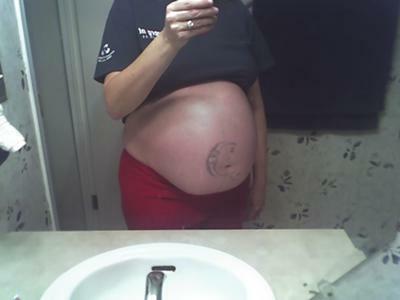 Only 8 more wks to due date...Right now 50.5" around...Aviana and Zander must be gettin' big.